Today, I am pleased to be part of another blog tour, sponsored by Carmel Communications, which you can learn more about here. This one is for a wonderful movie being released (today in fact) by Ignatius Press, entitled Mary of Nazareth. 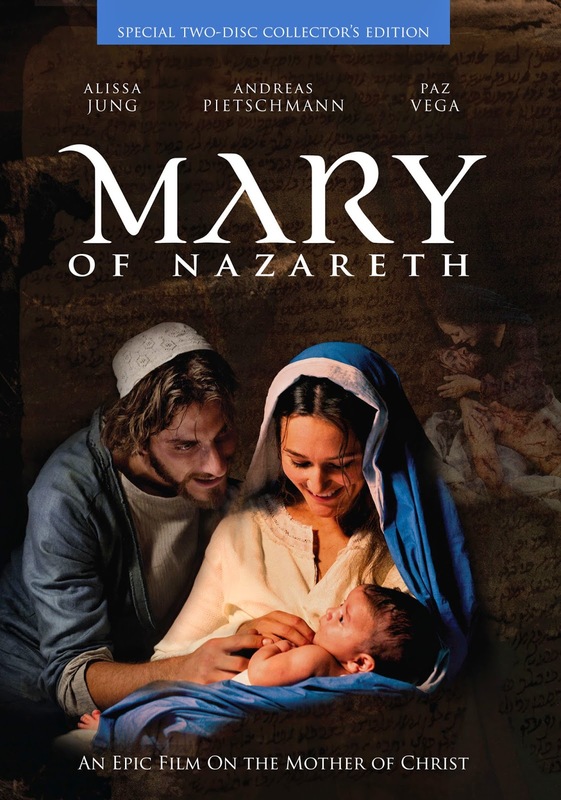 In order to promote this beautiful film and companion book, Mary of Nazareth: The Life of Our Lady in Pictures, we on the blog tour are going to share with you a video clip that corresponds to a mystery of the Rosary, and either an interview, a review, or our own personal thoughts on Mary and the specific mystery. Today, I will be sharing with you my thoughts on The Presentation of Jesus in the Temple, which is the Fourth Joyful Mystery. Before I share my reflections, let us first get our minds right by praying this decade of the Rosary. We will then view the clip, and I will provide a brief reflection on it. "And at the end of eight days, when he was circumcised, he was called Jesus, the name given by the angel before he was conceived in the womb. And when the time came for their purification according to the law of Moses, they brought him up to Jerusalem to present him to the Lord (as it is written in the law of the Lord, 'Every male that opens the womb shall be called holy to the Lord') and to offer a sacrifice according to what is said in the law of the Lord, 'a pair of turtledoves, or two young pigeons"' (Lk 2:21-24). "Jesus' circumcision, on the eighth day after his birth, is the sign of his incorporation into Abraham's descendants, into the people of the covenant. It is the sign of his submission to the Law" (CCC, 527). The Presentation in the Temple is a Feast Day that is widely forgotten/ignored in the West, but the East hold it in high regard and consider it one of the twelve Great Feasts. It is celebrated on February 2nd. Why this day? Because this is 40 days after the Nativity, and would have been when Mary's ritual purification was complete. There are some key points to notice in this scene. For starters, we see that Joseph brought two turtledoves for the sacrifice. Turtledoves were the poor family's offering. Had Joseph and Mary been wealthy, they would have brought a lamb for sacrifice. Jesus, the King of Kings, chose to be born into a poor family to show his great humility. If you are familiar with the Old Testament, you will notice that there was no offering to redeem Jesus from service to Yahweh. From this, we understand that Jesus was now in complete service to God. You could also say that He was not redeemed, because he was the One sent to redeem us all from our sins. I have always loved the figure of Simeon in the Bible. Though, he is in such a brief section, his appearance packs a punch! Here is a man who has been waiting his entire life for the coming of the Messiah.We too should be awaiting this glorious Second Coming and remember we are in this world, but not of this world. If you notice in the video clip above, Simeon also recognized Mary. Some would view this as taking a creative license. However, according to Tradition, Mary was taken by her parents to the Temple as a young girl. She lived there and served as a Temple virgin until she was betrothed to Joseph. We can find this tradition in the Protoevangelion of James. This feast is celebrated on November 21st and unfortunately is largely unknown in the West. I invite you to take the time about both Mary's Presentation and Jesus' Presentation. They reveal small, but key parts of Salvation History that will enrich our understanding of both Jesus and Mary. Ignatius Press has been releasing many great movies the past several years, and Mary of Nazareth continues that remarkable streak. In this movie, we see an intimate portrayal of the life of the greatest saint Mary. And while it will bring us closer to Mary, she will bring us closer to her Son Jesus. This movie will be a benefit for Catholics and Orthodox, and could even be used as an evangelization and educational tool for reaching Protestants. Be sure to check out my buddy Sarah's site, Snoring Scholar, tomorrow for the next stop on the Rosary Crawl.